In addition to having the opportunity to be slugs, winter was a time for feasting. A time to gather around the fire, play cards and enjoy good food. Once the MAH Margs or Jack Daniels was poured, the respective cooks would head for the kitchen and/or grill. Welch burgers, fish fries, you name it, there was plenty to eat and rest assured, it was good. However, on those very cold nights when a roaring fire wasn’t enough to keep you warm, you could be certain that it was time for………..Mama T’s Chili. In Louisiana, they have Midnight Gumbo, in New Mexico, they have Posole, in Oklahoma and Texas, we have chili. That’s right, good, down home, stick to your ribs chili. Now we can debate the best way to eat chili and I am not one to typically have an opinion, but I would put this chili up against any of that bullschit they serve in Terlingua. So alter as you must, but next time Old Man Winter pays you a visit, cozy up to a bowl of this goodness. The key to good chili is the layering of flavors. Therefore, pay close attention to the steps; it will pay off. In a large cast iron skillet or dutch oven, brown meat for 3 minutes over medium-high heat. Once meat is brown, add onions and sauté until onions are translucent, approximately 2 to 3 minutes. Pour in half of the chili powder and stir to coat meat. Add tomatoes, chicken broth, beef bouillon, paprika and Sazon Goya, bring ingredients up to a strong simmer, reduce heat and simmer for one hour. After the chili has simmered for one hour, add the remaining chili powder and all the cumin and garlic. Simmer for another 30 to 45 minutes. Now here’s the interesting/controversial part. 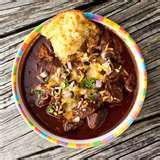 Depending on which part of the country you are from, chili can be eating many different ways. I prefer my chili as follows: spaghetti, beans, chili, cheese, onion, cilantro and sour cream. On occasion, I will acquiesce to the wife and substitute corn bread for the spaghetti, but contrary to most chili snobs, there is no wrong way to eat it, assuming your chili recipe is as good as this one. *Mama T’s Chili Powder is currently making the regulatory rounds and is not yet available to purchase. In the meantime, I would recommend Mexene. It has a nice balance of heat and flavor and is used quite often in chili competitions. **Sazon Goya is a soup seasoning found on the Mexican food isle of your local grocery purveyor. Goya makes several different types, I prefer the one that is coriander and annatto. This entry was posted on Monday, August 8th, 2011 at 6:07 pm	and tagged with Chili, Terlingua Chili Cookoff, Tex-Mex, Texas Chili and posted in Main Dishes, TexMex. You can follow any responses to this entry through the RSS 2.0 feed. Dix Cochon………I am a chili fan also. I will give your version a try…….probably minus the spaghetti. But, where are you in Texas that Old Man Winter won’t go away?? Or, was this post delayed in cyberspace for 8 months?? Let me know when your chili powder is available. GG. Summer activities have gotten the better of me, so I am revisiting favorite old blogs. We had a long cold spell last winter and wish it would return soon. I am currently out of chili powder, but will make up a batch and send it with TR or Aldi when they come down for the Brethen gathering.